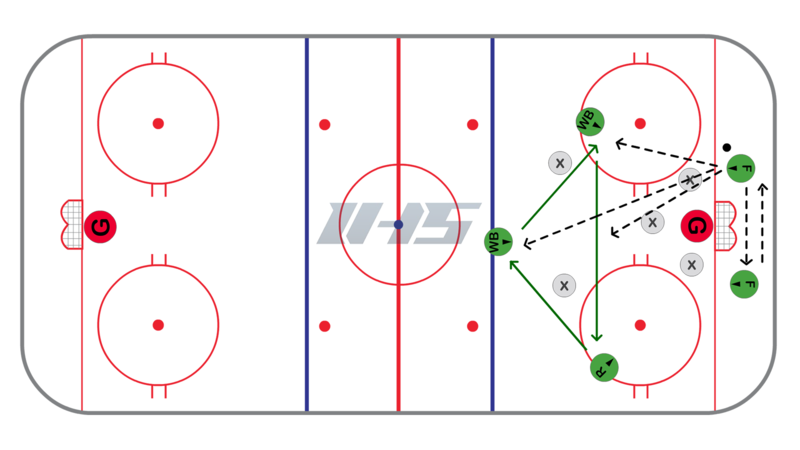 Offensive Zone - low to high rotating triangle | Ice Hockey Systems Inc. The idea in this offensive zone system is to control the puck down low. Eventually the puck will go from low to high to an open play but it starts with puck possession and protection down low with two forwards. The three players high in the zone can be positioned in a triangle shape and rotate. This creates confusion and opens up passing lanes from low to high. The forwards down low need to be creating time and space by switches and cycling the puck. When they get the chance they should be looking for the high players breaking into the seams.